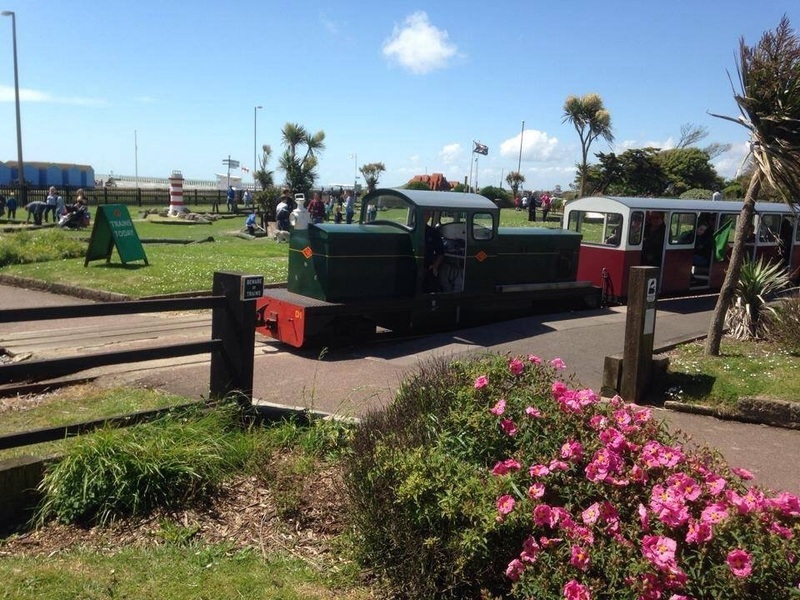 ​The earliest reference to a miniature railway in Littlehampton dates back to 28 June 1937; the minutes of the meeting of the Pleasure Grounds and Foreshore committee of that date, mention a proposal for a miniature railway, but the committee were unable to recommend the proposal. No further proposals were made until after World War Two. 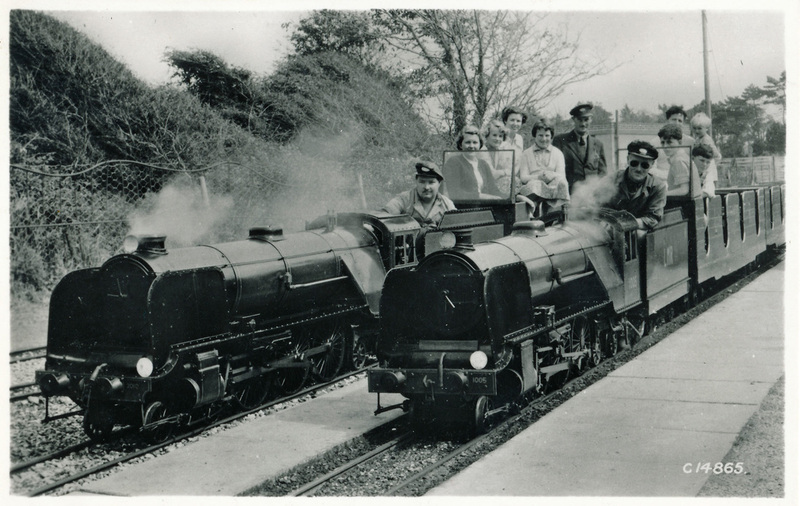 In 1947 a proposal to operate a miniature railway in the town was put forward by David Curwen Ltd, the Wiltshire based company were builders of miniature railway steam locomotives, and operated a number of miniature railways in the post war years. 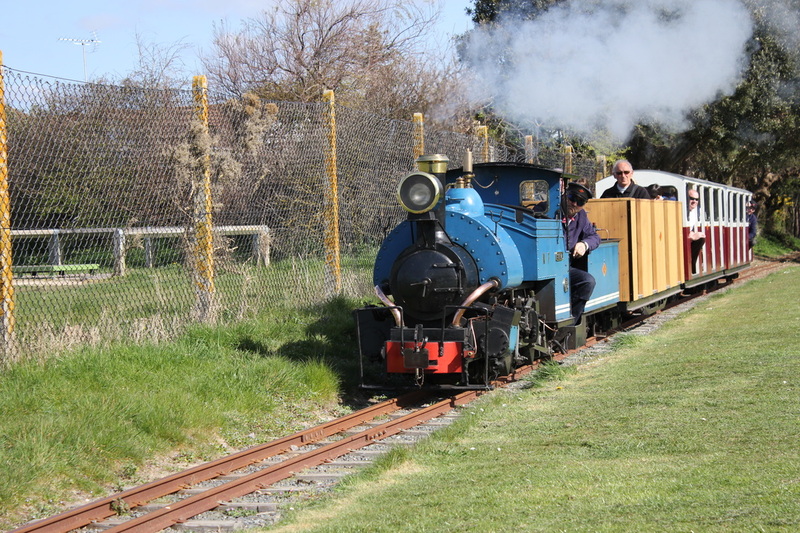 Littlehampton Urban District Council met with representatives of the company and set up a sub-committee to inspect Curwen’s miniature railways in Weymouth and Hastings. 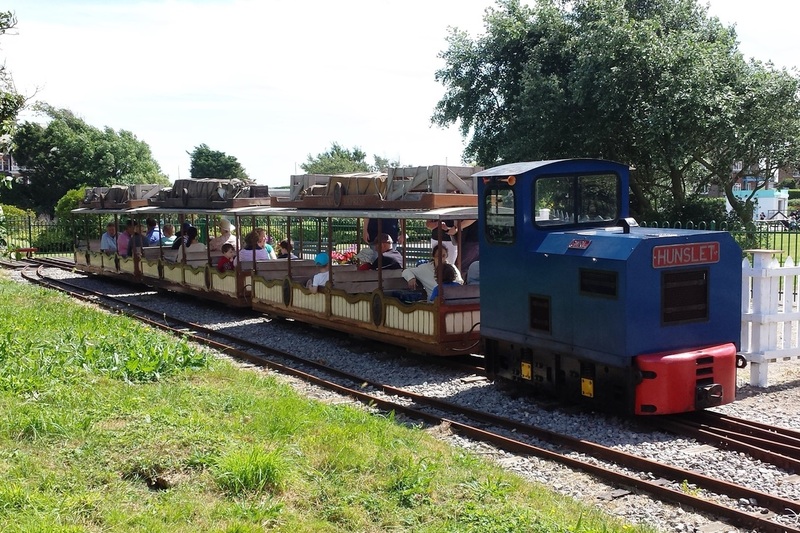 In the meantime the council gave approval in principle for the installation of a miniature railway on The Green, east of Norfolk Road and on Surrey Fields. 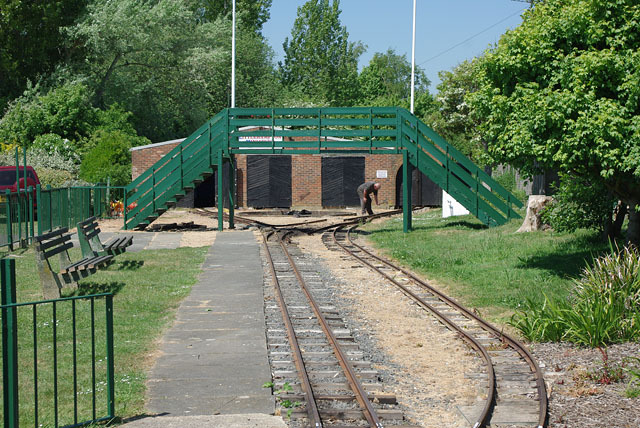 Several other offers to build and operate a miniature railway were considered and in the end the concession was awarded to Mr HG Cookson of Billingshurst. Mr Cookson had operated several 10¼ inch gauge railways on the south coast prior to WWII. A postcard of Norfolk Road station in the early years. ​Cookson chose the unusual gauge of 12¼ inches; at that time there were a good few 12 inch gauge railways around the world and three in the UK at Chessington Zoo (built 1932), Paignton Zoo (built 1940) and Ruislip Lido (built 1945, and still going strong). The reason Cookson chose 12¼” over 10¼” was for increased stability, he was probably influenced by his locomotive builder Mr TJ Thurston, who went on to open his own 12¼” gauge line on Hayling Island shortly after the opening of the Littlehampton line: the 12¼ inch gauge is very rare, with just six lines in existence, and Littlehampton is the oldest. 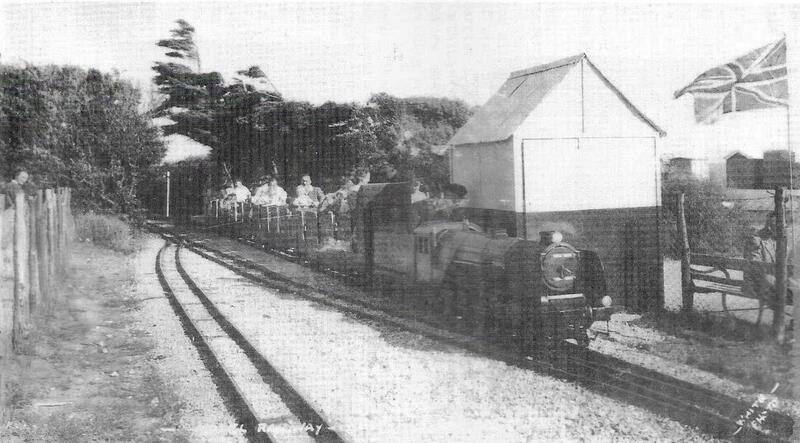 Under the terms of his agreement with the council, Cookson was required to provide the track and rolling stock, while the council agreed to provide paving slabs for the platforms, pay the rates on the site and carry out any necessary repairs to the boundary wall alongside Sea Road. Thurston was commissioned by Cookson to provide two steam locomotives for the line. 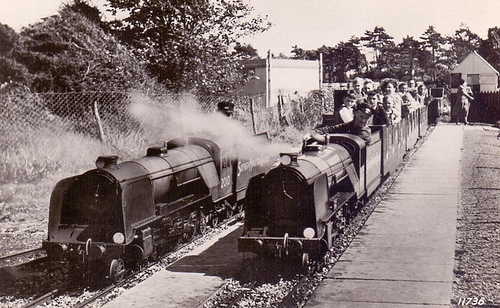 These were of the 4-6-4 wheel arrangement; number 2010, which had run at Cookson’s East Worthing Miniature Railway in 1947; and number 1005 built and delivered in time for the opening in 1948. Eight open wooden bodied coaches were provided, each seating 8 adults or 16 children. Some of the coaches had been transferred from East Worthing. The coaches were run as two rakes of four, one rake behind each locomotive; they were equipped with wooden windshields at the outer ends – later replaced by Perspex. The railway opened over the Whitsun weekend of 15th – 17th May 1948. An advertisement appeared in the Littlehampton Gazette on Friday 14th May. ​The Norfolk Road terminus (as it was then known) was situated on the south side of the bowling green - behind the current clubhouse - approximately 50 yards East of the current station. As the terminus was not equipped with a turntable at the time, locomotives would run round their train and return to Mewsbrook Park by running tender first. Running alongside the sea wall, J Mead at the controls - mid 1950s postcard. Mewsbrook Park in the 1960s, Mead (with dark glasses) in the cab of 1005, Turner (in Cap) standing behind. 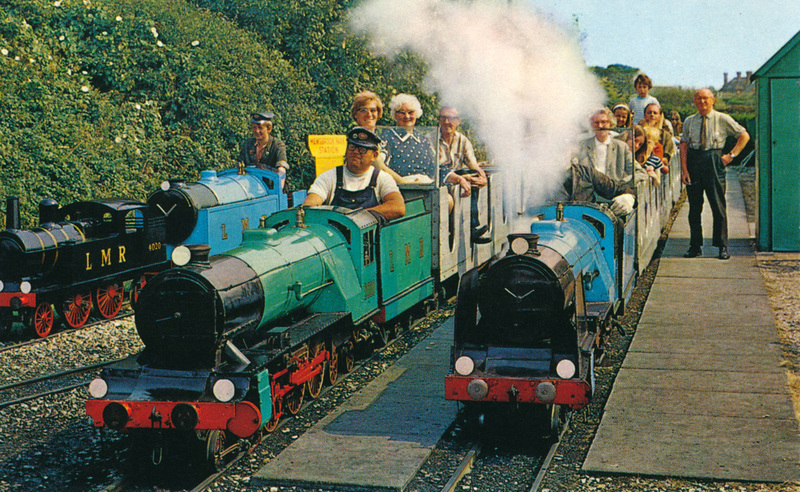 Locos lettered 'LMR' - Postcard courtesy West Sussex Record Office. The original licence granted by the council ran for three years from 1948 to 1950. Cookson however, only operated the line for two seasons selling to Mr. L Turner of Birmingham in February 1950. Turner was later joined by Mr. J Mead, who also operated the boats on Mewsbrook Park Lake. Mead was the engineer who kept the locomotives in excellent working order, while Turner looked after the operation of the railway; their wives ran the ticket offices at Mewsbrook Park and Norfolk Road stations. Turner and Mead ran the railway, using the original rolling stock, until the end of the 1968 season; the railway was put up for sale early in 1969. 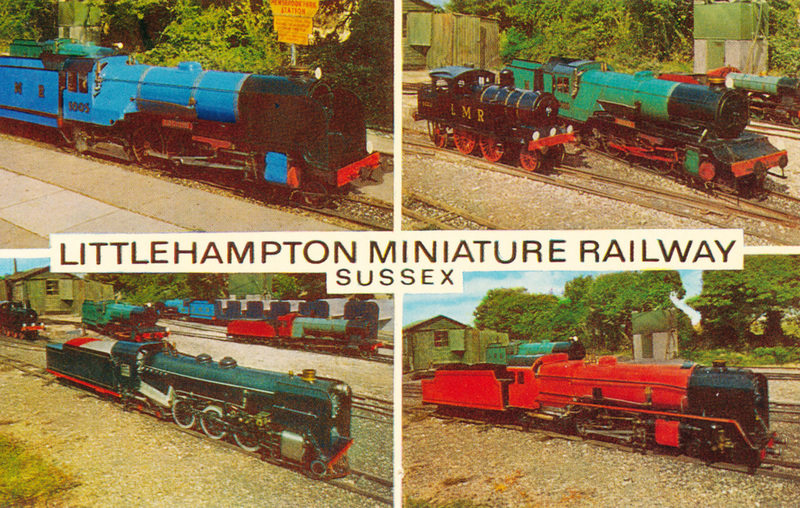 A postcard from the 1970s - The two locos in the lower pictures are 7&1/4 inch gauge and did not run on the LMR. 1974 Postcard by D Constance Ltd. Battery electric 4020 and diesel electric 3015 at rear with steam locos 2010 (D Gould on Footplate) and 1005 at Mewsbrook Park. Mr. A Maxfield purchased the railway as a going concern in June 1969, he appointed Mr. D Gould as general manager. Maxfield invested a lot of his time and money in the railway. One of his innovations was to rename loco number 1005 ‘Gordon’, and 2010 was repainted green and named ‘Henry’, after the characters in the Rev. Awdry Railway series books: better known today under the ‘Thomas and Friends’ brand – the current copyright owners would have taken a dim view of this breach! Maxfield added a number of locomotives to the fleet: 3015 was a steam outline 2-4-0 diesel electric loco which came from Bognor Pier, it was re-gauged from 10¼” gauge and remained on the line for 20 years, this loco hauled the train carrying the author on his first visit to the line: it broke down at Norfolk Gardens, and the driver pushed the train all the way back to Mewsbrook Park! In 1969 Maxfield built a 2-4-2 battery electric steam outline loco, number 4020, this was eventually sold to a private owner in 1984. In 1973 Maxfield purchased a 12 inch gauge 4-4-2 steam locomotive from the Olicana Miniature Railway in Yorkshire. The loco, named ‘Prince Edward’ was built originally for the Ruislip Lido Railway. This loco was found to be underpowered for the line; it spent some time on the South Coast World railway at Bognor Regis, and was eventually sold into private ownership in 1987. During this time, movement of contractor’s vehicles caused some displacement of the track, resulting in a number of derailments, thankfully these were not serious incidents. Following the works, the track was re-instated, but on a different alignment, being re-routed to the north of Mewsbrook Park depot and on a tighter curve around the golf course. In the mid ‘eighties a proposal was considered for a miniature Edwardian tram to run adjacent to the promenade from Pier Road car park to the East Green, where it would connect with an extension of the existing railway. This never materialised, but in 1984, the Norfolk Road terminus was moved westwards to a site beside the road, opposite the Green. No run round loop or facilities for passengers were provided, trains having to be propelled by the engine all the way back to Mewsbrook Park. 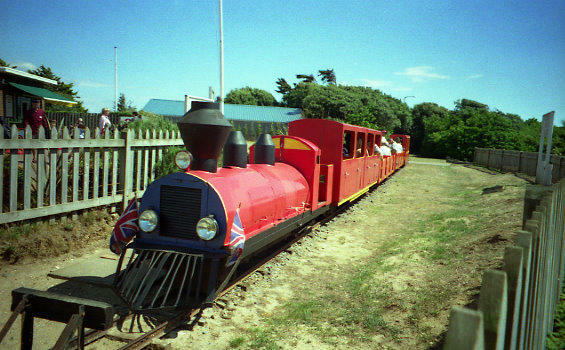 Petrol mechanical loco 'Zion' at Mewsbrook Park, it was transferred from Hotham Park in 1985 and re-gauged from 10 1/4 ins. The short lived terminus located between the Swimming Centre car park and the Sports Dome. Ex Chessington 4-4-0 'Queen Elizabeth' at the platform in 1986. Mr Maxfield, in cap and shades, is taking fares - photo Ken Bean. The Mewsbrook Park terminus was re-sited at the end of a new branch line running beside the swimming pool car park and terminating just west of Hendon Avenue, in an effort to raise the profile of the railway to visitors: the northern section of the line was used only to provide access to the works. 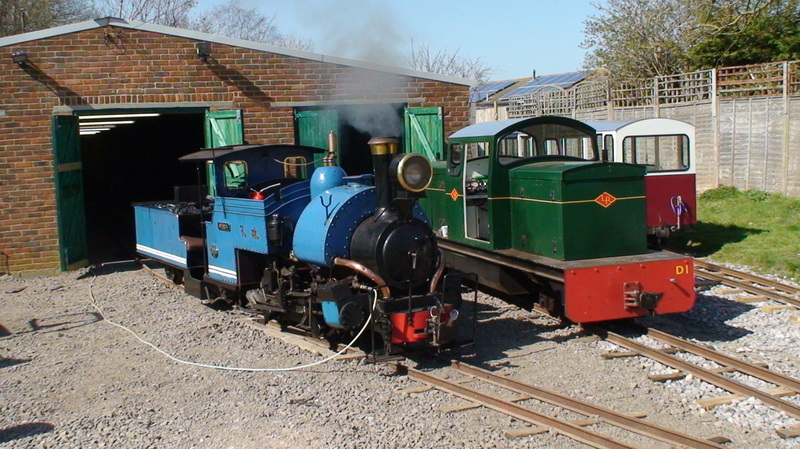 By 1984 the steam locomotives were worn out and motive power was provided by a small petrol mechanical locomotive named ‘Zion’ which came from Hotham Park in Bognor, and some extra carriages were purchased from the recently closed Chessington Zoo railway. A rather handsome steam outline 4-4-0 petrol engine locomotive named ‘Queen Elizabeth’, built in 1937, saw some service on the line in 1986, it was on loan from its private owner who had purchased it from Chessington Zoo. By the late 1980s, Mewsbrook Park station was in a sorry state. Petrol hydraulic loco 'Southern Belle' built in 1988 by Fontwell Engineering & CG Duggin. ​In 1985 Maxfield had obtained a new nine year concession, but in 1987 he sold the concern to the operator of the Mewsbrook Park Café and boating lake concessions, Mr. CG Duggin. The new owner only operated the line for one season, but he did construct a new steam outline petrol engined 4-2-2 locomotive, named ‘Southern Belle’; he also lifted the track from the car park extension and used it to repair the main line; the Mewsbrook terminus reverting to the original station site. This magnificent sign was one feature introduced during the Craven era. 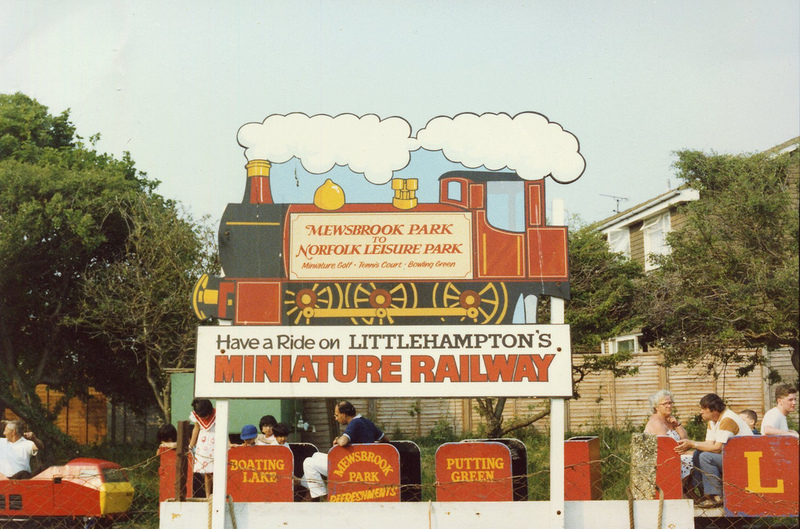 Proposed letterhead for the Littlehampton Miniature STEAM Railway. ​The operation passed to a Mr. B King in 1989, but he obtained alternative employment before the start of the season, the concession was then re-assigned to Mr. K Craven: the lease was due to expire on 31 October 1993. Summer holidays were now taken in warmer countries abroad by the majority of the population, and as a result passenger numbers were dwindling, much of the equipment had reached the end of its life and the railway was in a very run-down condition. Despite this, Craven and his partner a Mr. Phillips, ordered a new steam locomotive for the 1990 season. The loco design was based on a Denver and Rio Grande 2-8-0. Shortly after commencing construction, the builder, Iron Horse Engineering of Southbourne ceased trading. 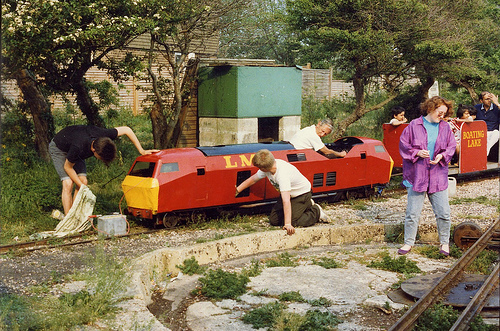 The incomplete locomotive was transferred to Steaming for Pleasure, in Yapton, where it was completed in 1998, and possibly sold on to a prospective buyer. 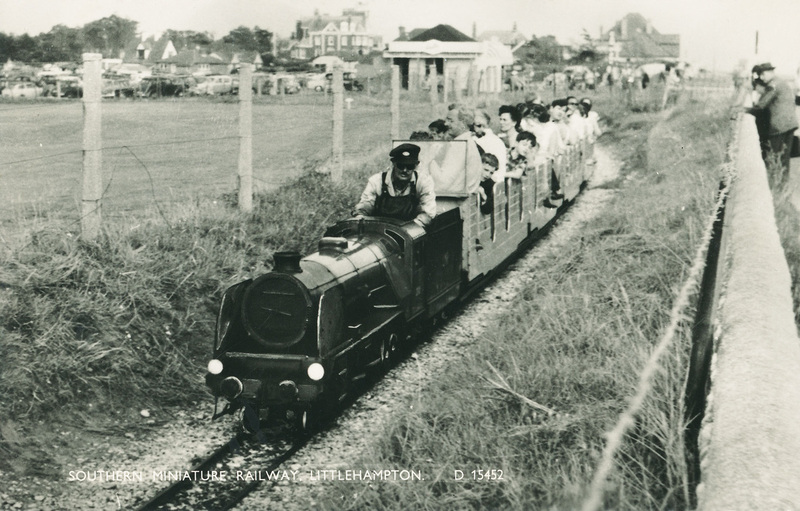 There is no definitive evidence that the loco ever ran on the Littlehampton line. Craven and Phillips struggled on, but the recession and a succession of wet summers resulted in operational difficulties. The council agreed to extend their concession to the end of the 1994 season. The council advertised for a new operator, but none came forward and Craven was instructed to remove his equipment from the site by the end of March 1995; it looked like the railway would close permanently. 'Southern Belle' and train at Norfolk Gardens in the mid 1990s. 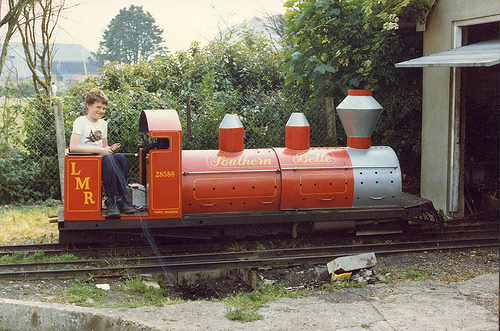 Colin Evans at the controls of 'Southern Belle' at Mewsbrook Park in 1998 - Photo W Simms. 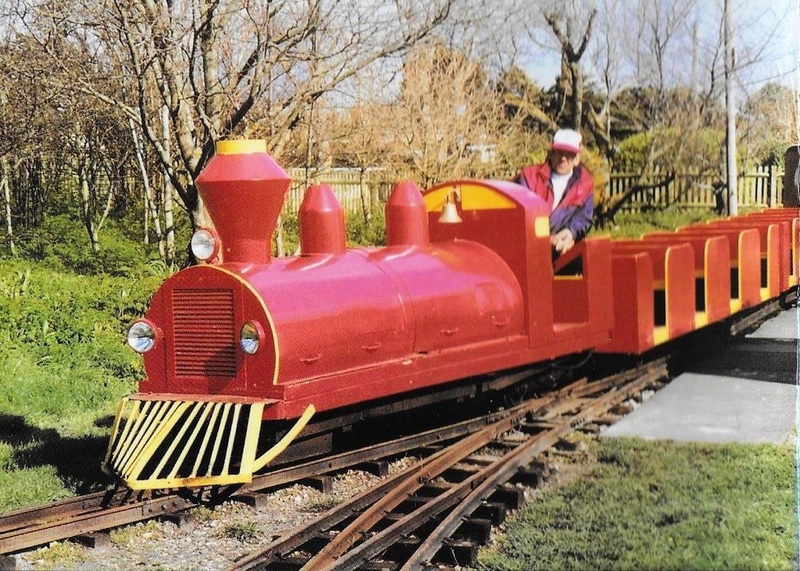 In June 1995 Mr. JC Chapman, operator of the Woodland Miniature Railway in Hotham Park, Bognor, purchased the railway and its equipment. The railway had suffered from neglect and vandalism but Chapman re-opened the line in late August 1995. Due to his other commitments, Chapman ran the railway as and when he was available rather than to a timetable, and prospective visitors were often disappointed to find that no trains were running. Despite this problem, Chapman was granted a new 15 year lease in 1996, one of the conditions laid down in the lease was that a new station was provided at Norfolk Gardens; this is the current station. Chapman sold the railway to Colin and Barbara Evans, the lease being transferred on 21 May 1997. Colin Evans laying track at the newly refurbished Mewsbrook Park Station. 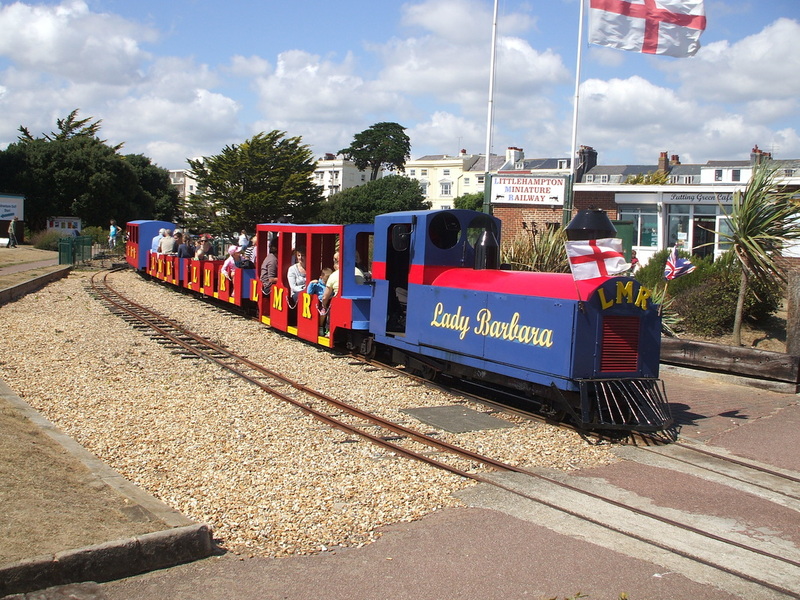 'Southern Belle' rebuilt as 'Lady Barbara' at Norfolk Gardens. A history of the first 50 years of the line, by Wilfrid F Simms, was published in 1998. Within a short time of taking over the Evans’s re-engined the petrol locomotive with a diesel engine and converted it to two axle drive, the bodywork was rebuilt with a fully enclosed cab, and the ‘Southern Belle’ was renamed ‘Lady Barbara’. 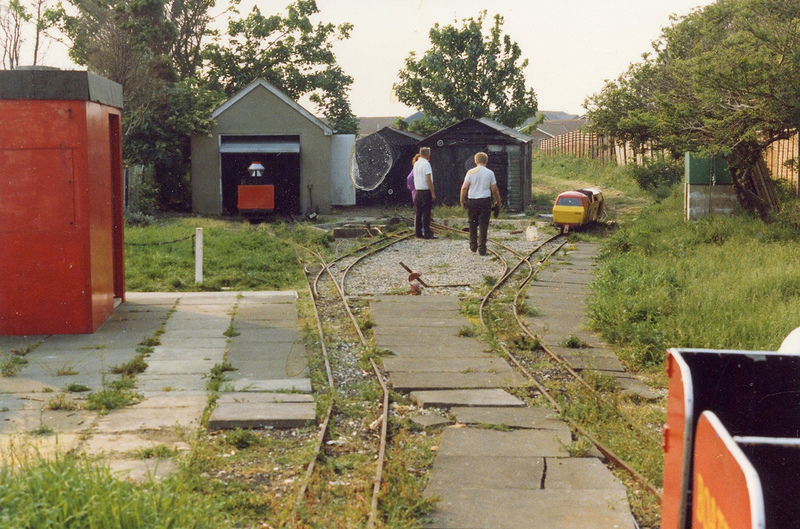 Colin and Barbara invested heavily in the railway upgrading the track and stations including installing new turntables at both ends of the line and building the substantial workshop and running shed, a tunnel was constructed alongside the shed, as this was fitted with doors at both ends, it was also used for carriage storage. In addition, some new carriage bodies were built on the ex-Chessington underframes. Sadly Colin’s wife Barbara died in 2008 and he found it difficult to continue running the railway on his own. The lease came up for renewal again in 2010 and ownership of the line passed to Chris Phillimore of Thirty Inch Railways Ltd. (TIR). Loco D1 'The Green Dragon' at Norfolk Gardens - Photo Malcolm Simpson. Fairbourne Railway's 'Sherpa' raising steam at Mewsbrook shed in 2012 - Photo Malcolm Simpson. In March 2011 the track layout at Mewsbrook Park was completely revised and new platforms were constructed at both ends of the line. The tunnel adjoining the Mewsbrook shed was demolished as clearance was insufficient to allow the new locomotive and coaches to pass through. New rolling stock was provided in the form of a 23hp Weston Rail B-B diesel hydraulic loco number D1 ‘Green Dragon’ built in 2007. Two semi enclosed coaches were also obtained from Weston Rail and an additional open coach was constructed by TIR on a Weston underframe. The railway was renamed ‘Littlehampton Railway’. The word ‘Miniature’ was dropped from the title, as in Chris Phillimore's opinion, the new larger loco and coaches conveyed the impression of a narrow gauge railway rather than a miniature line: the legal definition of a miniature railway, is any railway with a gauge less than 350mm; the gauge of the LMR is 311mm, it is therefore definitely a miniature railway! Services commenced on 16 April 2011 - the line was officially re-opened in June of that year - with a daily service continuing through the main summer season and weekend running throughout most of the year. 'Sherpa' in full cry, April 2012 - Photo Geoff Bashall. Chris Phillimore's loco and stock leave the railway, December 2015 - Photo Malcolm Simpson. Steam returned to the line in March 2012 when the 0-4-0 Saddle Tank loco ‘Sherpa’ arrived on loan from the Fairbourne Railway. The loco, a half scale model of a Darjeeling Himalayan B Class was built by Milner Engineering in 1978: the steam engine returned to Fairbourne after its last run on 13th May. 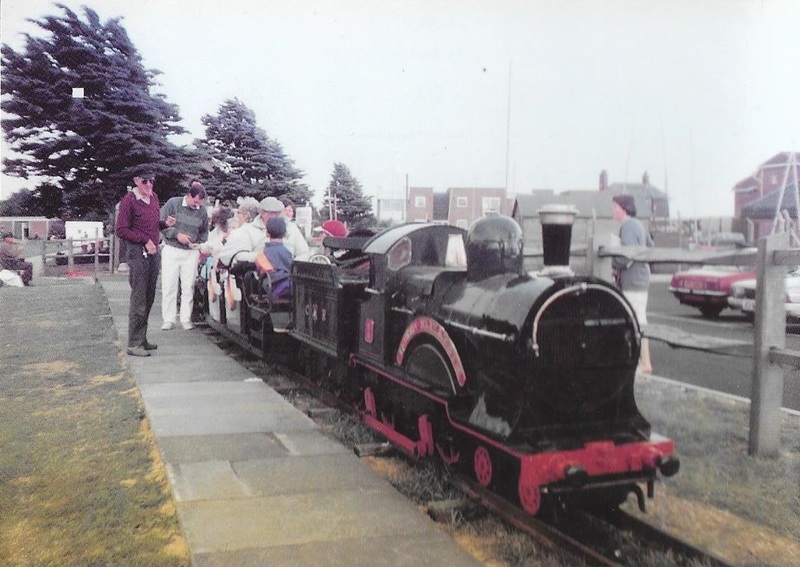 Perhaps indicating that a solely commercial operation was no longer viable in the post-crash economic climate, a local volunteer group ‘Friends of Littlehampton Railway’ was set up - led by Chris Shanks - to provide additional help and support with running and maintaining the railway. By the autumn of 2015, it had become apparent to TIR Ltd. that operation of the line was not commercially viable and trains did not run after the Halloween Specials at the end of October. The locomotive and coaches were removed from site in December 2015. 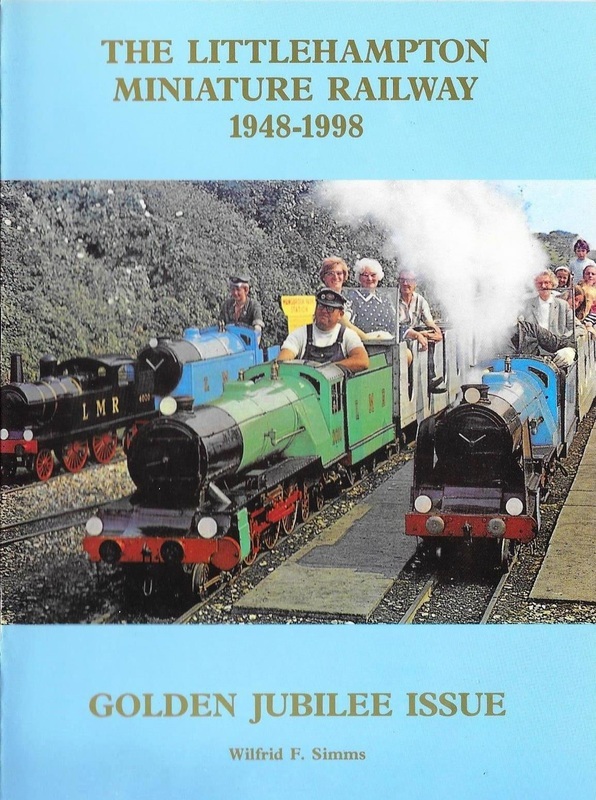 Many people thought that this truly was the end of the line, but in early 2016 a new volunteer organisation, the ‘Littlehampton Heritage Railway Association’ (LHRA) was set up under the chairmanship of Chris Shanks. 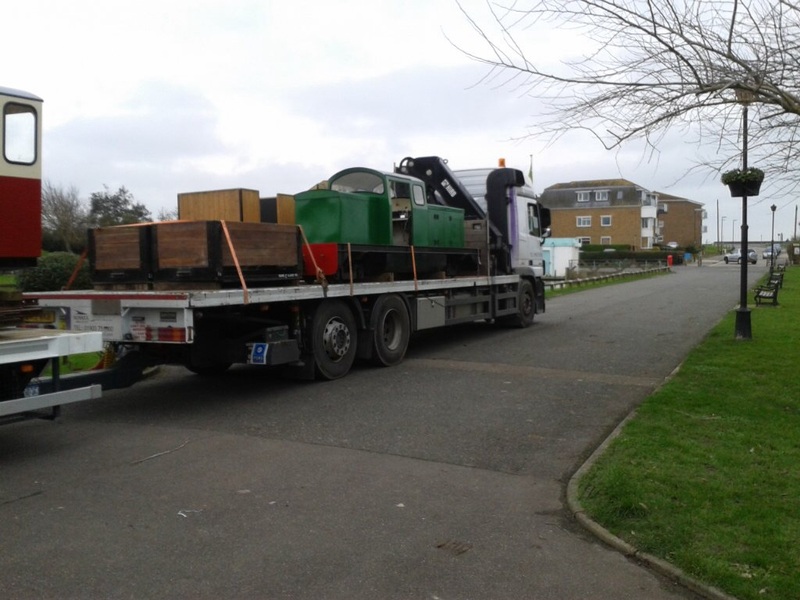 The LHRA in association with Arun District Council took over the running of the line, on a not for profit basis, reverting to the title ‘Littlehampton Miniature Railway’. The passenger service commenced on 23 July 2016; an official opening - with special guests Nicholas Owen (BBC News, Classic FM) and Councillor Stephen Haymes (Chairman of Arun District Council) - took place on Saturday 13th August...and so the story of the LMR continues. 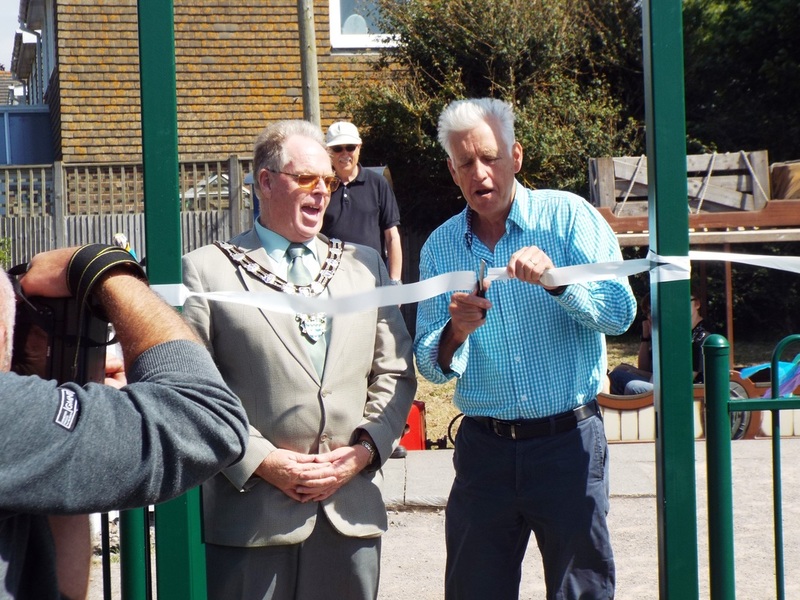 Councillor Stephen Haymes and Nicholas Owen at the opening, 13 August 2016 - Photo Alan Beadle.